Diepenbrock composed the music for De vogels (The Birds) in the summer of 1917 for a production by the pupils of the Stedelijk Gymnasium (Municipal Grammar School) in Amsterdam. At their request the comedy by Aristophanes had been translated into Dutch by their Latin and Greek teacher Dr Christian Deknatel (1875-1925). In February 1918 two performances took place in the Amsterdam Palace of Industry, which were directed by Frank Luns (1886-1936), while Diepenbrock conducted an ensemble of members of the Concertgebouw Orchestra. Diepenbrock suggested contacting Johan Wagenaar (1862-1941) no doubt due to the experience his peer had with setting humorous librettos to music. Six weeks later he reported that he had passed on the request to the young composer Matthijs Vermeulen (1888-1967). In the meantime Diepenbrock had studied the translation, which he thought was made in a very talented and skilful manner . (BD IX:254) Nevertheless, on 6 July he made known that both Vermeulen and he had decided not to compose music for De vogels because of the financial risk; he estimated that the funds for the musical part (the fee for the composer and the expenses for all the musicians) simply could not be raised. (BD IX:259) Therefore Diepenbrock advised the pupils to perform the play without music. In other words, Diepenbrock was afraid a vocal setting of the text would seriously affect its clarity. The composer does not explicitly answer the question whether “declaiming” the choruses should or should not be accompanied by music in this first letter, but his phrasing suggests that at this stage he considered musical accompaniment to the choral songs a prerequisite. It was not until the end of August, when Diepenbrock had made sketches for almost the entire work, that he must have informed the spokesperson of the pupils of his decision to partake in the project after all. (BD IX: 267-268) He used the autumn of 1917 for the orchestration; the autograph score gives 21 December as the date of completion. So when composing the work, Diepenbrock gave priority to the Lied van de hop and the Overture, an extensive orchestral piece, while he postponed the actual request of the pupils, which was setting the choral songs to music. Did he deliberately aim for a commission to write incidental music for the whole of Aristophanes’ play? In any case, it must have been a great creative opportunity for him, as he had not written any symphonic music since Lydische nacht (Lydian Night, RC 118) in 1913. Besides, the utopian subject of Aristophanes’ comedy (the bird society is hailed as an alternative to the restless life in Athens) appealed to Diepenbrock in the turbulent war situation of 1917. Working on the score may also have been a welcome distraction from his marital problems which came to a head exactly in those months. In view of the performance of the comedy, which initially was to take place in the Amsterdam City Theatre in March 1918, Diepenbrock already tried to interest Richard Heuckeroth (1885-1960), the new conductor of the Arnhem Orchestral Society, in the project in September 1917. However, at the beginning of November it turned out that the music was too difficult for this orchestra. (BD IX:297) In January 1918 Diepenbrock received permission to hire 43 members of the Concertgebouw Orchestra (see BD IX:574). The score for spoken voices, tenor, female choir and orchestra comprised six parts: Overture (I), Lied van de hop (II), melodramas with dance (III, IV and V) and Finale (VI). 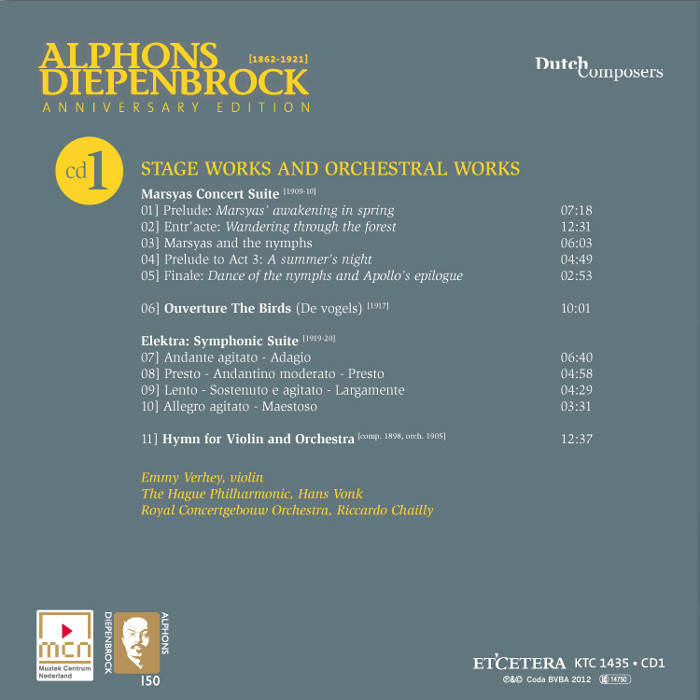 I do not believe that he portrayed the voices of nature in his Marsyas in a more warm and melodic way than in the middle movement of this little symphonic poem. Neither do I believe that he expressed his technical control of the notes, while maintaining the lyrical delight, in a more virtuoso manner than in the beautiful canon on the nocturnal and intoxicating love songs of the nightingale that is so magically imitated in the vocal accents. (BD IX:578). 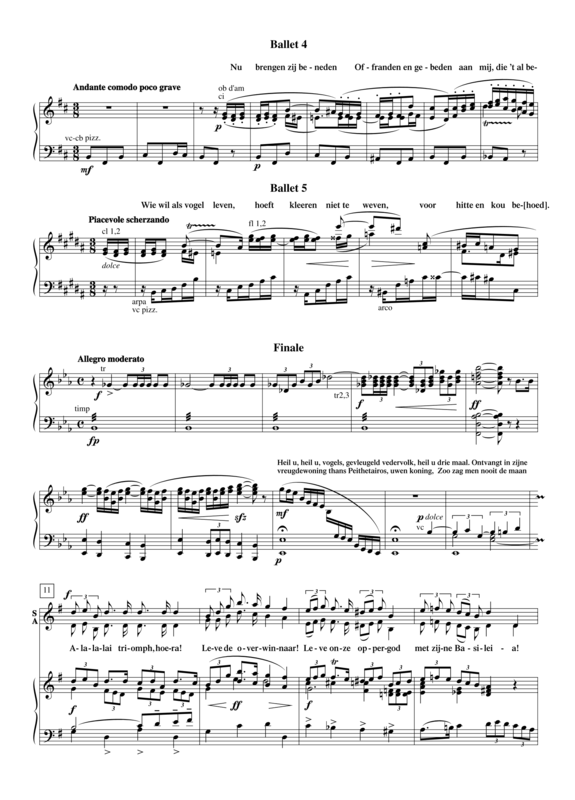 This ‘lament of the nightingale’ for flute and later piccolo solo, which is the most expressive element of this richly coloured bird chorus, returns in the following part. 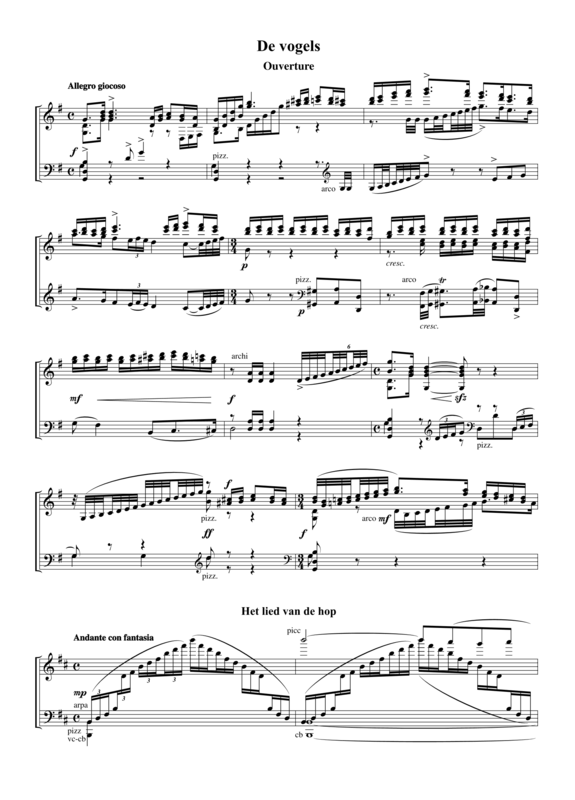 The lyrical Lied van de hop, which was written for the voice of the popular tenor Louis van Tulder (1892-1969), closely follows the poetical text. For instance, the anapaests that Deknatel had managed to maintain when translating the Greek lines of poetry, determine the rhythm of the vocal parts and Diepenbrock used virtuoso runs, imitation of bird song and harmonic accents to depict their content. Curiously, Diepenbrock composed the short dialogue in which Pethetairos and Euelpides comment on the song of the hoopoe, as melodrama. The choral songs, the so-called ballettos, are also set as short, dansante melodramas (III, IVa and IVb, Va and Vb) with a simple accompaniment that matches the light, pastoral character of the texts. The pupils of the grammar school were assisted by students of the Amsterdam Theatre School who danced according to the method of Émile Jaques-Dalcroze (1865-1950). At the initiative of Balthazar Verhagen (1881-1950), an ex-pupil of Diepenbrock and the secretary of the Alphons Diepenbrock Fund that was founded in 1921, a reconstruction of the original mise en scène took place in the autumn of 1925. Evert Cornelis (1884-1931) conducted the Utrecht City Orchestra and the Toonkunst Female Choir. The leader of the choir was the 20-year-old Joanna Diepenbrock (1905-1966). The Lied van de hop was once again sung by Louis van Tulder, who this time appeared on stage in a bird costume. 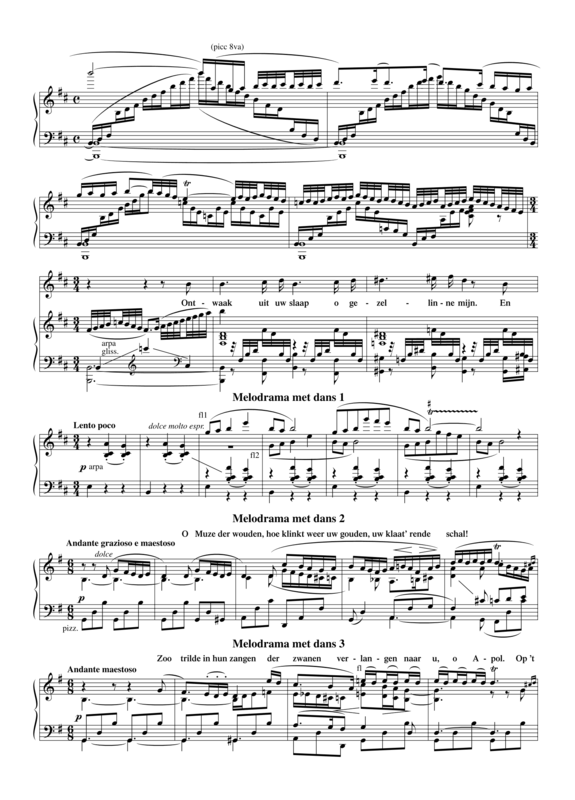 Soon the overture of De vogels became one of Diepenbrock’s most performed works. This was instigated by the composer himself, who in March 1918, a month after the premiere of De vogels, conducted the overture and the Lied van de hop in the Concertgebouw. It was not until October 1921, after Diepenbrock’s death, that Willem Mengelberg conducted the overture. He also presented the work at a concert with The Philharmonic Society in New York in March 1922. 15 feb 1918: Eerste opvoering van De vogels in het Paleis voor Volksvlijt te Amsterdam door de Letterkundige Gymnasiasten-Vereeniging “Disciplina Vitae Scipio” onder regie van Frank Luns en met medewerking van leden van het Concertgebouw-Orkest onder leiding van Diepenbrock. Solist: Louis van Tulder. Diepenbrock heeft dezen zomer muziek bij de vogels gecomponeerd: een ouverture, een tenorsolo (het lied van den nachtegaal) begeleidende muziek bij de reien en een slotkoor. Het talent van Diepenbrock wordt nog steeds rijker en sterker en ook beheerschter in uitdrukking en vorm. Ik ken geen muziek van Diepenbrock, welke origineeler, verrassender en melodischer is dan deze ouverture, waarin de bezieling en de verbeelding den componist geen oogenblik hebben verlaten. Als inleiding tot begrip en genot van het dichtwerk is de ouverture ook voortreffelijk opgevat met haar blijspel-toon naar fladderende rhythmen, haar marsch-tempo's en daartusschen haar zangerige betooverende fragmenten. De fluit-solo geschakeerd door de ruischende figuren van de harp, lokt als een verre zoete droom, als een verschijning uit de Attische wereld van schoonheid. — En telkens als later de muziek optreedt, wordt men getroffen door dezelfde superieure eigenschappen. Alleen het luidruchtige slotgedeelte met den weinig expressieven koorzang voldeed mij minder, en scheen mij niet op dezelfde hoogte als het voorafgaande. De orkestrale uitvoering door een gedeelte van het Concertgebouw-orkest met Zimmermann aan het hoofd en onder leiding van den componist was uitstekend, en de nachtegaal-solo werd door van Tulder met frischheid en gloed gezongen.